by Ryan November 26, 2011 August 8, 2017 . November 26, 2011 — Words cannot begin to express how amazing my wife is. On my birthday my wife decided to surprise me for lunch. Before we left, she gave me my big birthday present … tickets to the Michigan vs. Ohio State game at Michigan Stadium in November! The last time I had been to a game versus the Buckeyes was back in 2003, which just so happened to be the 100th anniversary of the rivalry between the two schools. 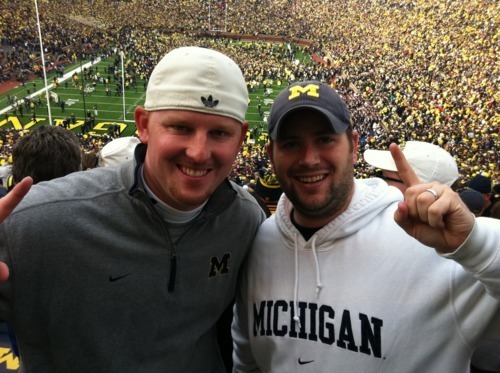 One of my best friends Neal and I had incredible seats thanks to a connection he had (Michigan won the 100th anniversary game, by the way). When the time came for me to travel up to Ann Arbor, I made sure to update my vehicle with new car flags and blasted “Hail to the Victors” for nearly the entire trip. Since Brittany wanted me to enjoy the game with Neal, she stayed back in Toledo and went shopping with my Mom and sister. Neal and I wasted no time meeting up and finding a parking spot near campus. As we headed in to Michigan Stadium, there was a nervous excitement in the air, but I was confident that this would “be our year”…and thankfully, I was right! Michigan pulled off an incredible victory to beat the Buckeyes for the first time since 2003. If it wasn’t for Brittany’s thoughtful gift on my birthday, I wouldn’t have been there to witness the victory and I’m still in shock that I had the opportunity to cheer them to victory over Ohio State in Ann Arbor! Here’s a picture of Neal and I as thousands of fans run on to the field to celebrate! And here’s a video from the end of the game when we all knew the fat lady had sung!